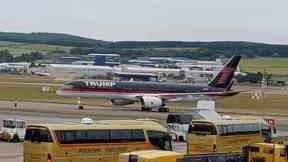 US president will touch down in Scotland on Friday night before going to Turnberry. Donald Trump will spend the weekend at one of his Scottish courses. 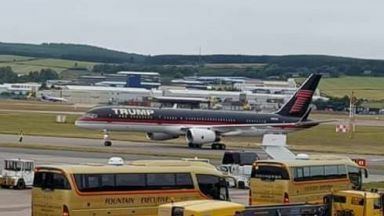 Trump's son, Eric, touched down in Aberdeen shortly before 7am on Thursday. 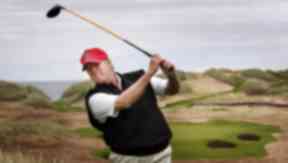 He is playing at Trump International Golf Links at Menie, Aberdeenshire, with members from America. So far, Trump has spent 125 days at his golf properties during his presidency, according to NBC News, but the precise number of times he has actually played golf is difficult to track as trips have mainly been weekend private visits. He last visited Turnberry in 2016 to reopen it after a £200m refurbishment. At the time, he was the presumptive Republican presidential nominee and staff at the course wore caps with the message "make Turnberry great again" in a nod to his campaign slogan. The deal had little of the controversy around his Aberdeenshire development, with questions only raised over the decision to change the name of the resort to Trump Turnberry. Turnberry staged the women's Open in 2015 with Trump in attendance, but as he stepped up the rhetoric in his US presidential campaign, the R&A - the governing body of golf - said the course will not be considered for holding the Open before 2022 at the earliest. Charlotte Ahmed, 57, a teacher and SUTR Glasgow spokeswoman, said she hopes tens of thousands of people will turn out for protests organised up and down the country this weekend. She said: "He's a racist, he's a misogynist, he's a warmonger, he's a liar and his actions are encouraging racists and fascists all over the world. "This is a really frightening thing that such a person should be coming to Scotland, this beautiful country. "We are hoping that hundreds of thousands of people don't want Trump here and we want to make sure that the protests are seen and heard as widely as possible."